If you follow me on Instagram you may have seen that a while ago I suffered the first - of probably many - shoe shop meltdowns. Coco needed plimsoles for PE and her very first sports day. She wanted trainers - which I would have been happy to buy IF we had had a more imaginative choice. But hey, guess what? We could either have had trainers in pink or in blue, or green. I tried to convince her of the merits of converse which were a bit more imaginatively multicoloured but she was having none of it. She wouldn't even try them on. I remember the shoe wars of my childhood very well. We had a shoe shop in the family... it stocked a lot of Clarks - funnily enough as I type I'm wearing a lovely pair of Clarks sandals that I've had lots of compliments on, but when I was younger I dreamed of Freeman Hardy & Willis - anyone remember that shop? I was not allowed to have shoes from there; which of course made them all the more desirable. Actually that is not strictly true, when I was 10 I had a pair of FH&W patent red pointed toe shoes with a plaid bow on them. I LOVED them. I remember the day after I got them I woke up and thought I'd dreamt them up, but when I peered over the edge of the top bunk I saw them sitting on our blue carpet. My shoe love was born. 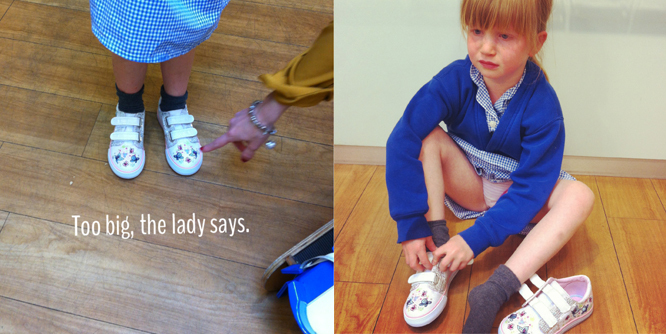 So I really do empathise with Coco - and so I let her try on the glittery pink 'trainers' she desired. They didn't fit. Now as much as I would have probably let her get them, I'm not going to buy her shoes that don't fit (well, maybe if the seriously cute converse ones hadn't have fit, I might have considered it) so on the spur of the moment while the tears started trickling down her cheeks I had a brainwave. I bought the plainest pair of plimsoles the shop had and then... This happened. 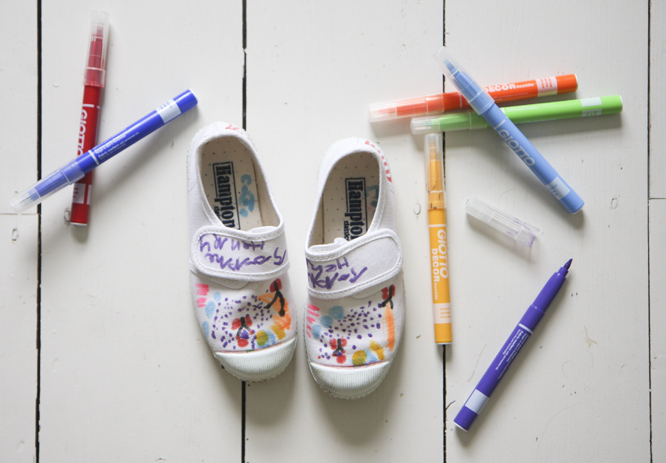 Customised trainers - complete with her 'new' name de jour 'Sophie' written on them! 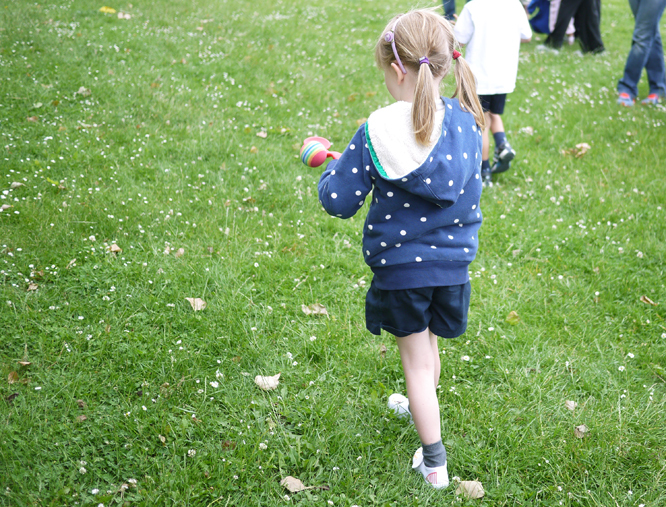 And here they are in action - the egg and spoon race. ...only nearly as we had more tears on sports day due to the fact that one of her friends was wearing the previously mentioned glittery trainers. Sartorial battles, peer pressure. It all starts here. Great thinking. I bet she loved decorating them. I had similar battles with my daughter, still do if I'm totally honest. Ha! Freeman, Hardy & Willis, now there's a blast from the past!! oh that's so cool, well done Coco on the trainer designing!